Every homeschooler wants to get a peek into another’s day. We’re always curious about how other mom’s manage. Maybe your homeschool tends toward very school-at-home, or classical, or project-based. We all picture every other homeschool mom as being a Pinterest-worthy super-mom, but really, we’re all pretty much the same – just doing our best to educate our children as well as we possibly can. This school year, I am teaching a 11th grader, two 8th graders and a 1st grader. My plate is FULL. I can honestly say, this has been my most challenging school year, as it’s the first time I am teaching all four of my children – last year we did a very relaxed unschooly year with my youngest. I would call what we do Charlotte Mason inspired. 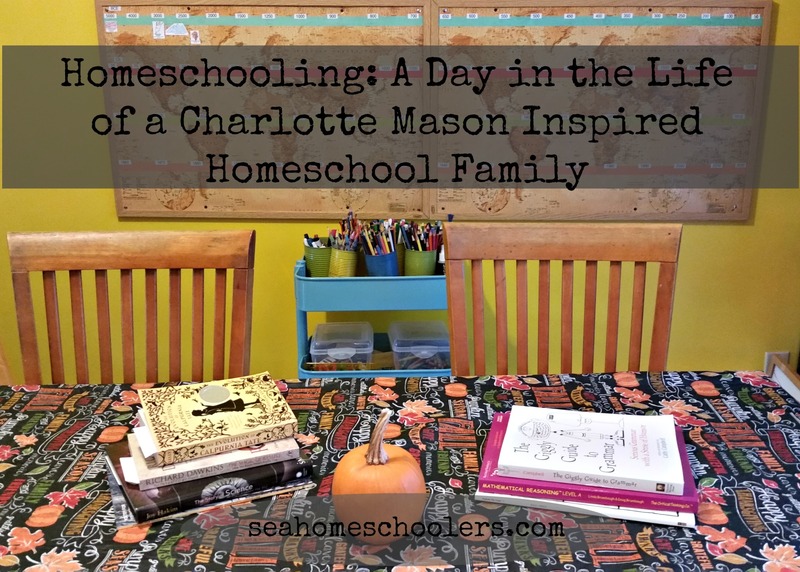 I am by no means a die-hard Charlotte Mason homeschooler. We don’t do handicrafts, I get to nature study once a month (twice a month if I really push myself! ), I haven’t touched Plutarch’s Lives since my oldest was 10 and it drove her to tears, and we get around to Artist Study maybe once or twice a year. Those things are all wonderful, but they just don’t rank very high in priority around here. My twins are musicians, so a great deal of their day is devoted to practicing. Robbie plays the drums and piano and Riley plays guitar, and they practice around 3 – 5 hours a day. 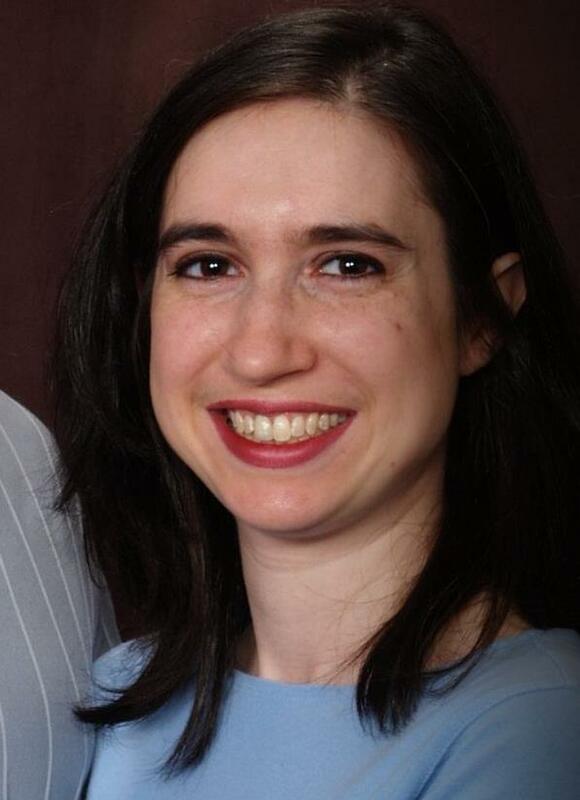 My oldest – Sarah takes piano, but isn’t very devoted and only practices around 30 minutes a day, and my youngest, Regina, just started taking drum lessons and Robbie helps her to practice about 20-30 minutes a day. The drummers have their lessons on Tuesdays for about an hour, Riley goes for his lesson on Wednesday, and Sarah and Robbie take piano on Thursday afternoons. Riley might be adding piano as well, since both boys are considering going to Berklee College of Music for college, and piano is a requirement. All three teens also just started First Robotics, so that’s another huge time commitment. They currently have team practice 3 times a week, for 3 hours on evenings and 5 hours on Saturdays. To say our days are full would be an understatement! 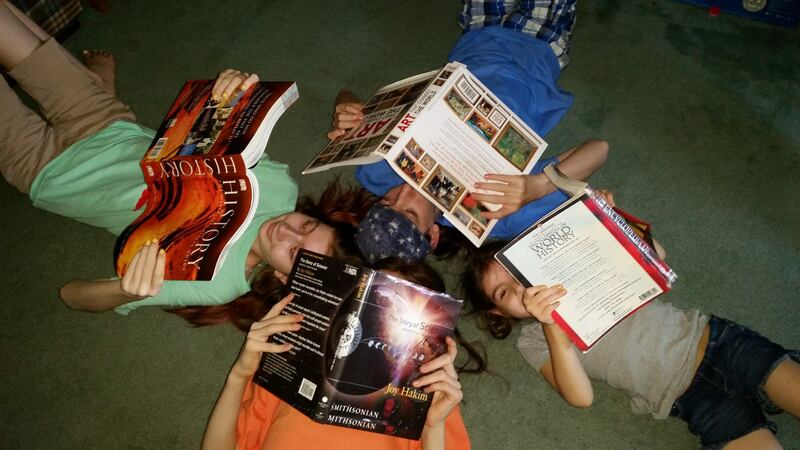 Let’s take a look at what an average day looks like at our little homeschool! I try to get a good start on our school day, so I get up around 7:15 am to take a shower and get myself moving. When I’m done, I start a load of laundry, then wake up the teens (the 6 year old is usually up by then and watching tv while she waits for the rest of us to wake up), make myself a cup of English Breakfast Tea, and feed the kids breakfast. While they are eating, I tackle our morning reading. 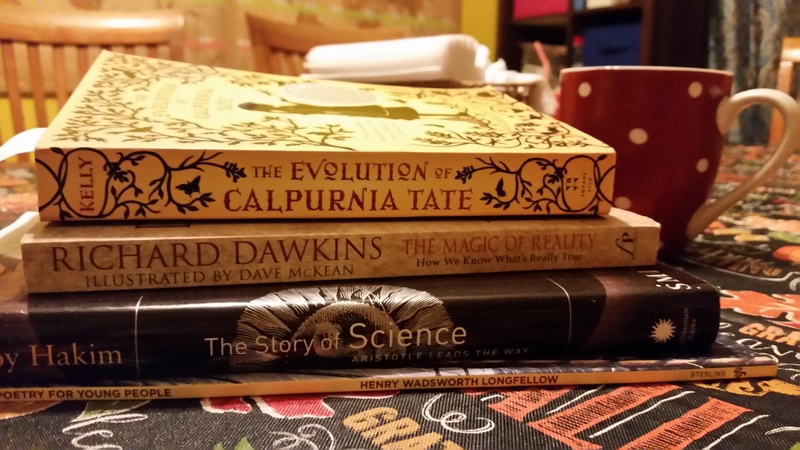 I like to break up our reading in chunks – in the morning I read our History of Science spine – Joy Hakim’s The Story of Science, and whatever our current read aloud happens to be; right now we are reading The Evolution of Calpurnia Tate by Jacqueline Kelly. This is also where I’ll go over our day, we’ll discuss any assignments they are supposed to be working on, appointments, errands or activities that might be happening later in the day. After we’re done with our reading and we’ve talked about what we read (usually I prompt the kids with questions, but occasionally they’ll ask a question and it gets a good discussion started), I send the kids up to get dressed. My oldest is pretty independent this year and is taking classes through an online school. She gets herself started and checks in with me throughout the day. We chat throughout the day to make sure she’s staying on task, but I’ve seen a huge improvement from last year already. As soon as the boys are dressed, they alternate an hour and a half of morning music practice with math, grammar, spelling and reading. They use Teaching Textbooks for math, so I just check in to get their daily grades and that’s it. I love this program because I am pretty math phobic, and it’s very hands off for me. We also add in Khan Academy if they need extra practice with something. My high schooler does her math through Khan Academy. We do grammar around 3 times a week using Giggly Grammar, and for spelling I pull words from our weekly dictation assignments that I think will trip them up. I give them a different spelling task each day of the week – copy the words 5 times, write them in alphabetical order, write the definitions, etc. They also use the dictation passage for copywork once or twice a week depending on the difficulty level of the passage. 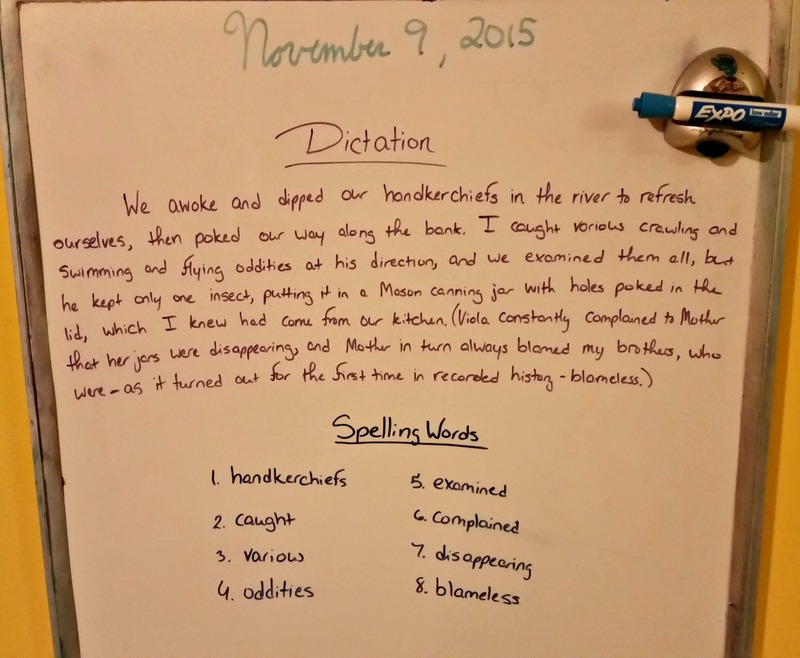 On Fridays, we do the dictation passage which also doubles as their spelling test. They do almost all of this independently – I’ll usually go over the grammar lesson to make sure they understand, but otherwise, they can handle all of this on their own. I will often give them a writing assignment here too – generally something to do with their History of Science studies or the book they are currently reading. By the time the twins have finished their music practice/math and reading rotation, it’s about time for lunch. If my oldest doesn’t have a class, she’ll eat with us, otherwise she gets something a little later. At lunch, I grab a glass of iced tea and we do our second big reading chunk. This is generally where I’ll read aloud some poetry, or we’ll read from The Magic of Reality by Richard Dawkins, which we’ve been reading in little snippets and discussing. I’ll also read another chapter of our read aloud. After I eat, I squeeze in some housework – I wash the dishes, sweep the kitchen and fold laundry. I also have the teens do some of their chores here – bathroom clean up, dusting, vacuuming, etc. After lunch and chores, I work with my twins on history and science. Since we are doing the History of Science this year, this is the part of the day that we’ll do experiments or projects for that. We’re also slowly working through Big History Project, and I need to go over their lessons with them. I usually set up my 6 year old with something – playdoh or a puzzle, to keep her occupied while I work with the twins. If Sarah isn’t busy, she’ll take her outside to play for a little while. Around 1PM the boys do their second music practice rotation – this is usually a 2 hour session. When not practicing, they work on projects – art, work for Robotics, unfinished school work, etc. 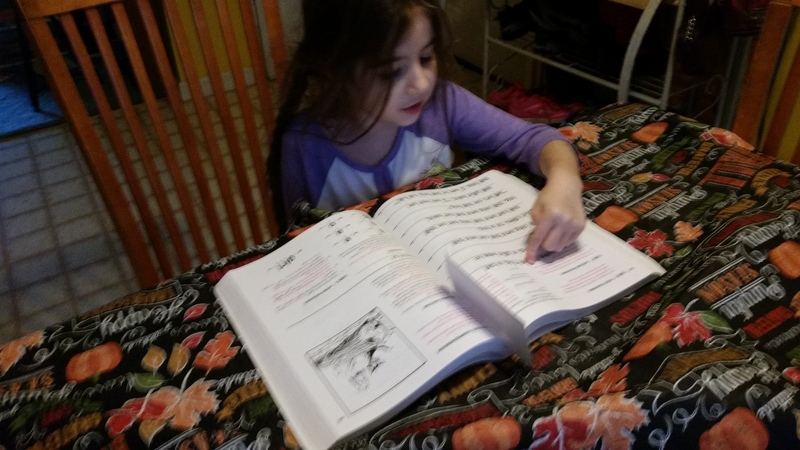 My 6 year old has free time – her morning lessons usually take about an hour and a half, and she’s free the rest of the day to play. If it’s a rough day I might put on a movie for her at this time. This is also when I work – I give myself the hours between 1 and 4 to get to any work I need to do – answering e-mails, writing, filming and editing videos, etc. Then I start working on getting dinner started. Dinner is also where my husband will ask the kids to tell him something they learned that day. Everyone is expected to tell something different and add to the discussion. It’s a fun way to sneak in a narration because everyone wants to tell something interesting. Almost all of the kids activities are in the evening, so after dinner, the kids help clean up and then get ready to go out to either Robotics or music lessons. On nights that the boys are home for the evening, they add in another hour and a half or so of “band practice” where they play together or work on original compositions. While the teens are out (my husband does the chauffeuring) I play a game with the 6 year old or we might bake a treat or do an art project. After she goes to bed, I catch up on reading, work, or maybe just veg out and watch some tv. And that’s our day folks! This is a very typical day – some days we drop everything to work on a project, or if the boys have a recital or performance coming up, we’ll just do the basics and they’ll spend most of the day rehearsing. We do tend to be home more often than not, as the majority of us are homebodies. I’ve also learned that if we’re out of the house, we get less school work done, and we get behind. So, we save our out-of-the-house activities for the evenings so that we have plenty of time to get our lessons done. I’ve been doing this for so long now (we’re in our 13th year!) that it has become pretty routine. The kids all know what they are supposed to do and when, and my role is mainly to be their mentor and guide, ushering them through their day and leading them down the path that will take them to successful adulthood. this time i am reading this great educational paragraph here at my home.